In 1917 Rudolf Steiner’s Threefold Social Organism was an attempt to save a devastated Europe. 100 years later do we have a new chance? 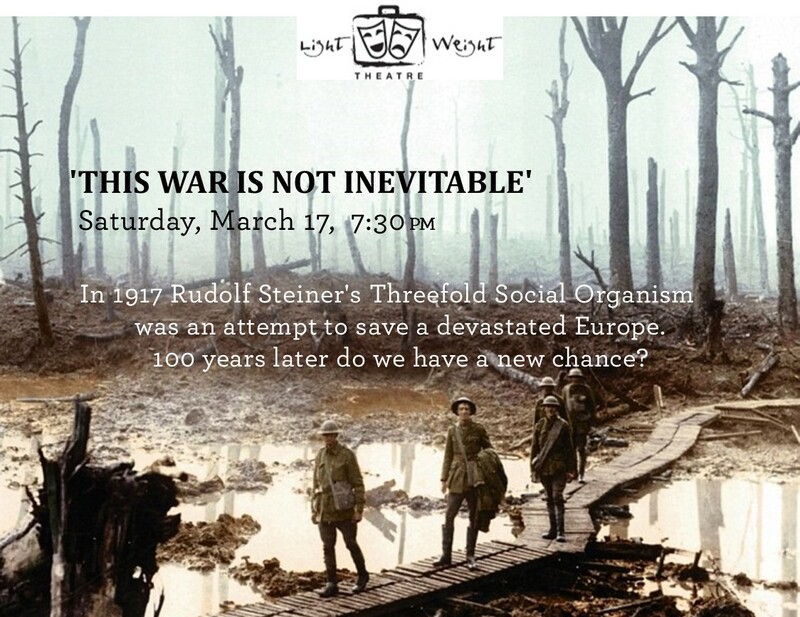 More than a Play, this Timely Event concerns the birth of and reaction to the Threefold Social Organism idea, 1917-1919 . . . and what it can tell us about where we are 100 years later. Everyone is Welcome – recommended for high school age and above. Rudolf Steiner launched his idea in 1917 to help shorten the war and prevent another great conflagration from breaking out later. Questions? Contact RSC at 916-963-4000 or conf@steinercollege.edu. Information on the Threefold Social Organism Theatre Project: www.wordrenewal.org. Apr 7, 8 or 9 – Ann Arbor/Detroit and Chicago? Sun, Apr 15 – New York City or Spring Valley?